Dr. Eric Stein is the principal scientist at Southern California Coastal Water Research Project where he oversees a variety of different kinds of projects focused on instream and coastal water quality, bioassessment, hydromodification, watershed modeling, and assessment of wetlands and other aquatic resources. This brown bag seminar is the second of three seminars focused on flow targets and ecology (part 1 is here). Dr. Stein noted his presentation is focused more on water quality impacts rather than fisheries. 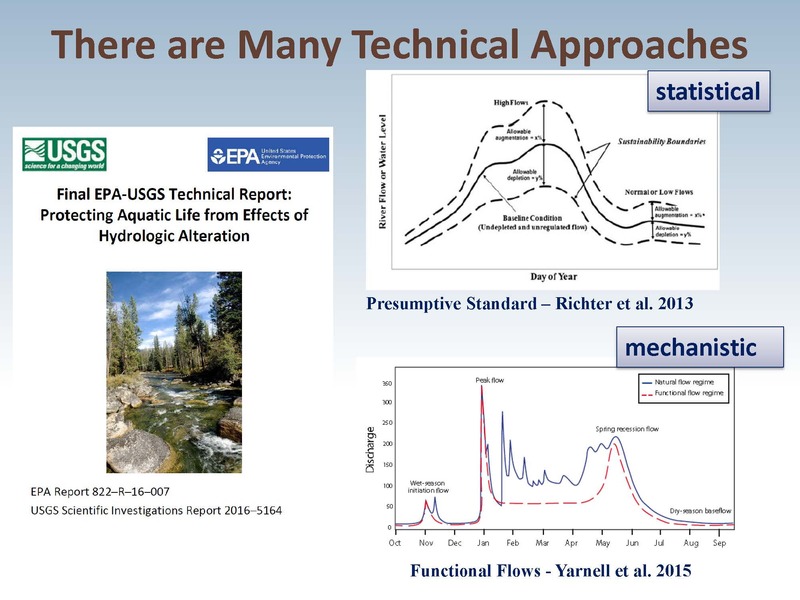 The work presented in this seminar is part of an integrated framework that has been developed by a technical group working over the past year and a half trying to figure out how to approach environmental flows and develop assessment frameworks and tools to inform the variety of different policies in the state that are affected by environmental flow considerations. He noted that environmental flow considerations transcend many agencies and many different programs, so the framework is an attempt to organize the science to support a variety of different agency programs. California has a lot of complex environments due to its continental-scale variability in precipitation, temperature, and elevation, Dr. Stein said. 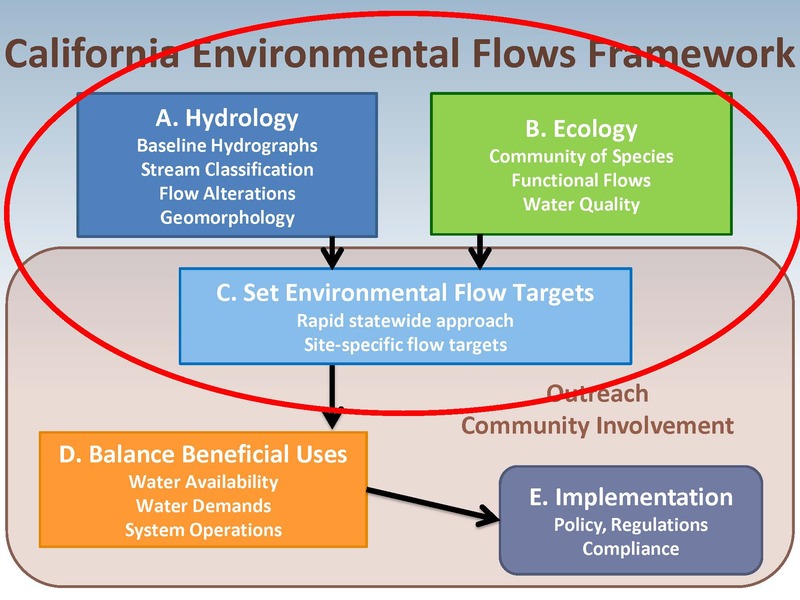 The slide shows three different streams in the state, all of which have different environmental flow needs, so the framework needs to consider different stream types. Many programs are attempting to set environmental flows, and they each have different endpoints and management needs. 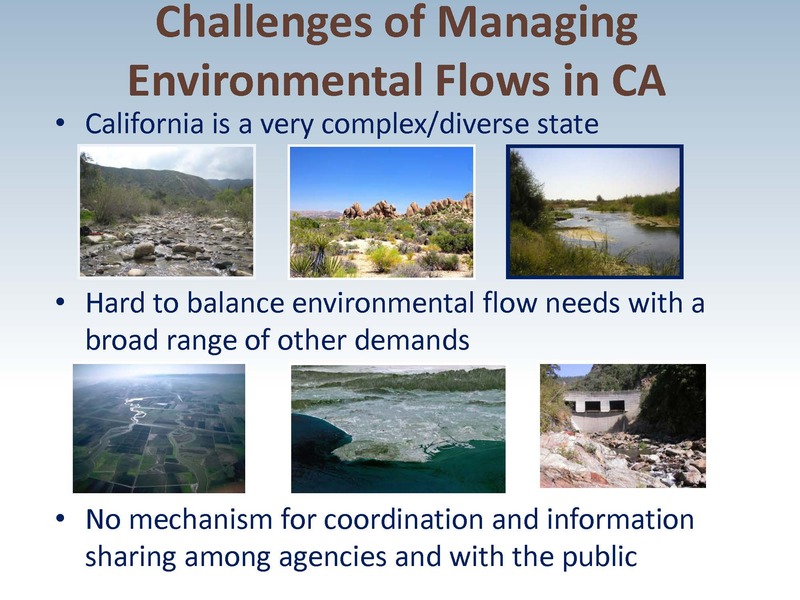 Management concerns can vary depending on location: sometimes there are urban issues, such as water reclamation or stormwater capture and reuse; other times, there might be issues associated with dam operations; or there might be issues associated with agricultural water diversions or groundwater use. Another significant challenge is coordination because the responsibilities are spread among many different agencies and programs, and mechanisms aren’t always in place for coordination between the programs for things like data sharing and technical tools, or on policy implementation. The workgroup is working in coordination with several agencies around the state to develop a framework that could be applied statewide that considers hydrology and ecology together and utilizes that understanding to set environmental flow targets. That framework can then transition into the policy implementation stage where competing beneficial uses are considered and the implementation challenges that go along with that, he said. Another goal of the framework is to assess vulnerability. 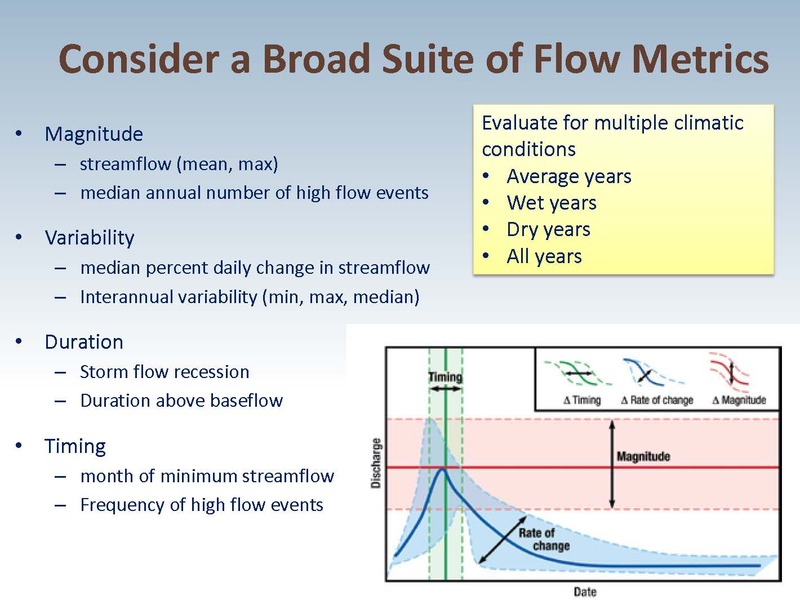 For example, in Southern California, Dr. Stein said they were looking at climate change predictions on flow and what that means from a vulnerability perspective which is their reason for thinking about environmental flows. The framework can also evaluate and inform management actions such as wastewater reuse or dam operations, as well as assist with assessing whether hydrology is the most important management concern or if it is another factor, such as temperature or water quality. For all these reasons, understanding the relationship between flow and ecology is really important for answering all of these questions, he said. So the framework starts with a statewide approach, which is really intended to provide a first tier way to look at setting environmental flow targets that could be applied anywhere in the state at a relatively coarse scale; the next tier would then provide a way to develop more region or location-specific flow targets that take into account some of the very local considerations. This needs to be done in a way that utilizes standardized ways of collecting data and provides consistency so that the information can then be shared. 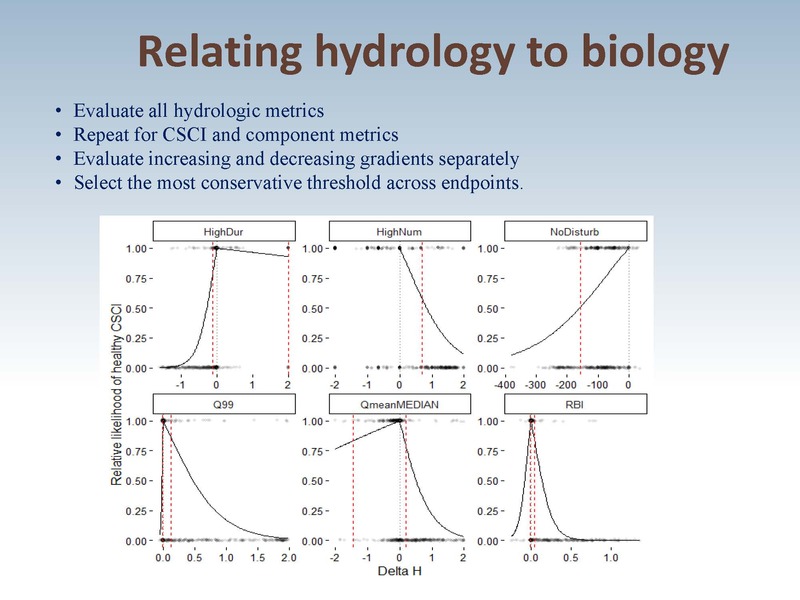 Within the nine hydrologic classes of streams, dimensionless unit hydrographs can be used to understand reference hydrology, set preliminary targets based on the reference hydrology, and then to think about what other appropriate ecological end points might be relevant for each of the hydrologic classes. Dr. Stein said the rest of his talk would be focusing on the second tier of the process, which is getting into the more detailed site specific environmental flows approach; however, he will be discussing a specific application in Southern California that doesn’t have to do with salmon. 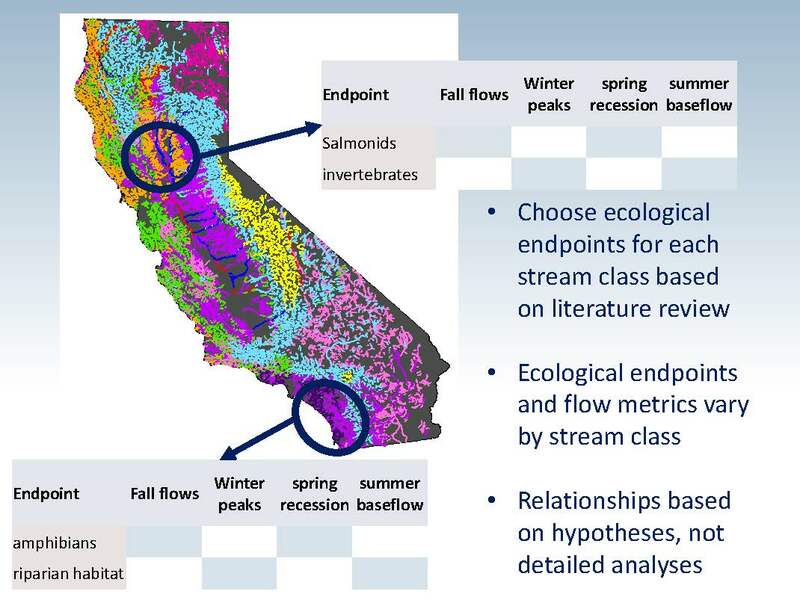 Most people who look at environmental flows are thinking about a specific taxa like salmon, and are considering the life history requirements for the species, such as cues to migration and breeding requirements; next they think about the hydrologic conditions that are important to support the life history stages, how to manage the hydrology to support the life history, and how that affect things like dam and reservoir operation. Dr. Stein said while that’s how the majority of environmental flows work in the state has progressed, it isn’t really relevant for a lot of the issues they face in Southern California. He did acknowledge that there are some steelhead streams in Southern California, but for the most part, fish issues aren’t the driving issues for the region. 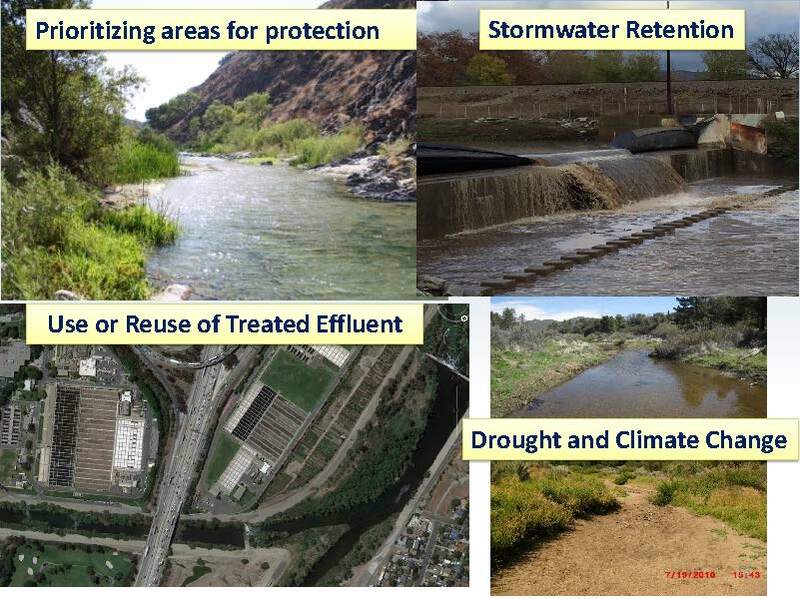 Another issue for Southern California is with stormwater retention where some of the peak flows are being used for groundwater recharge or potential reuse, and what are the implications of retaining those stormwater runoff flows from an ecological perspective. There are also concerns about protecting some of the areas that are intact from future land use changes and what effect the projected fundamental shifts in the ecosystems associated with climate change will have on environmental flow requirements. 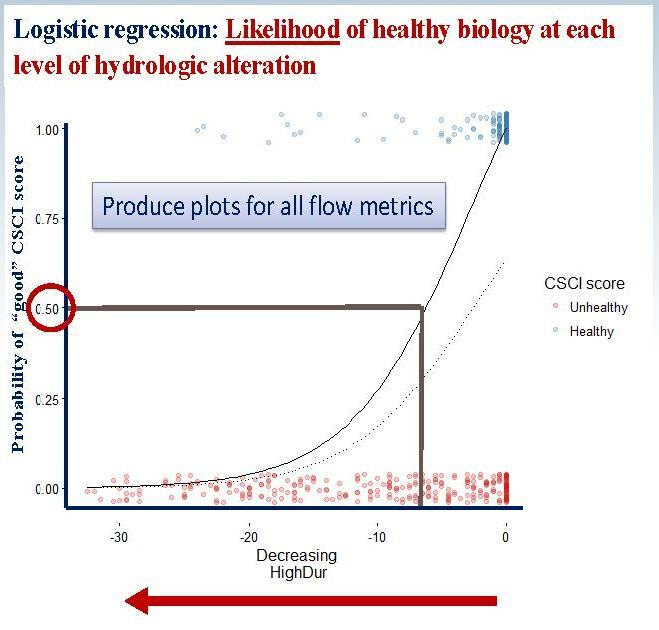 He presented a slidem with a graph, noting that what they try to do is when setting flow targets is to create graph similar to this where the y axis represents the potential change in the biological community, and the x axis is the change in flow regime. The question is how much the biological community might change in relation to the change in flow regimes and what rate of change is acceptable. “So if we can create this .., we can understand how does that change in some hydrologic measure related to a change in the biological community, and then use that to set management targets,” he said. In Southern California, the waterways of concern are not rivers but instead are the smaller, wadeable streams, most of which are intermittent and dry up or are spatially intermittent or temporally intermittent over the course of the year. They are focused on benthic invertebrates as the main ecological end point because most of the issues as it relates to environmental flows in Southern California are driven by the water quality programs, rather than by the water rights or water supply programs. 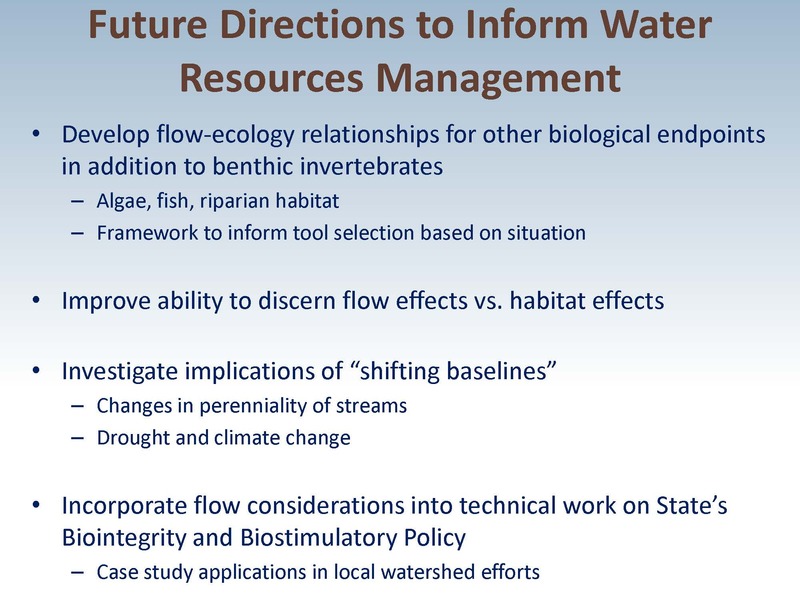 The next challenge is to select the local approach to tackle environmental flows, and Dr. Stein noted that there are many options available for this. 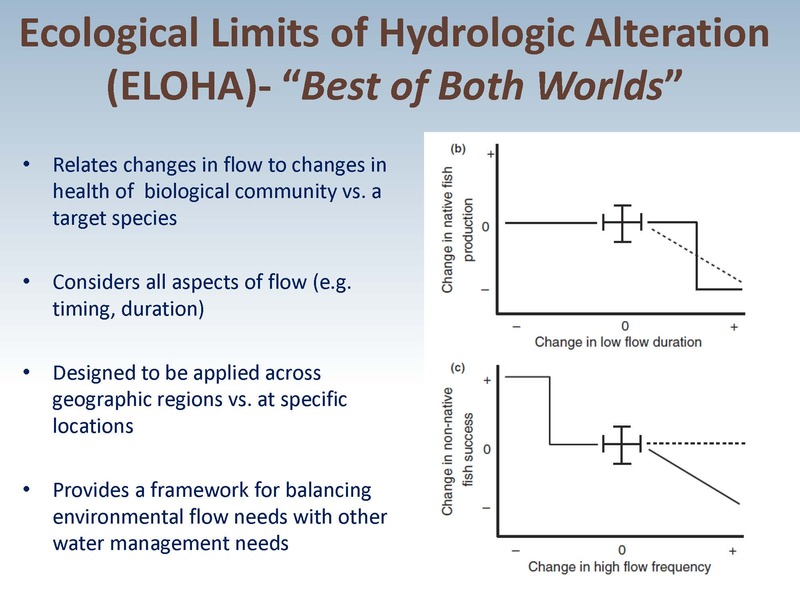 In Southern California, they use an approach called the Ecological Limits Of Hydrologic Alteration (ELOHA) which Dr. Stein described as a hybrid approach that has mechanistic underpinnings but is largely a statistical driven approach. He said it was an appropriate choice because they are not focused on a specific taxa, like a certain bird or a certain amphibian, but are focused on a community of benthic macroinvertebrates as the assessment end point. The first step is to estimate the degree of hydrologic alteration. 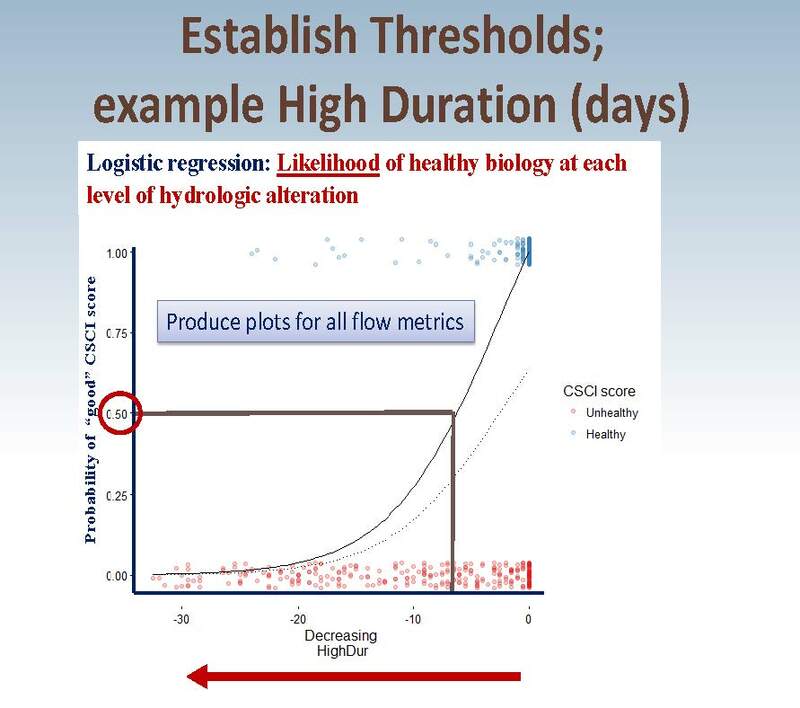 The basic premise is to relate hydrologic change to biologic change, so you have to first estimate the degree of hydrologic change between natural and current conditions by calculating a series of flow metrics. That hydrologic change is compared to some response in the biological community. In this case, they use the benthic macroinvertebrate index in the CSCI to establish thresholds of biological response. 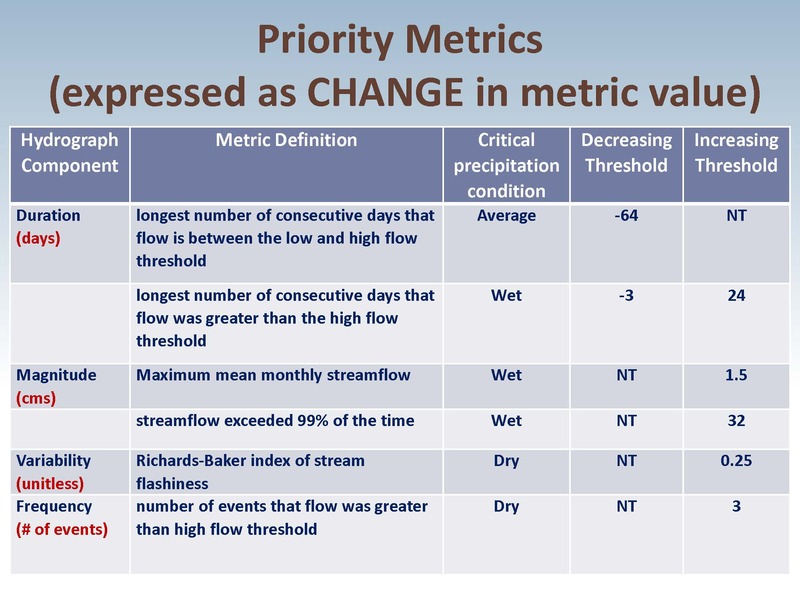 Develop a regional index of hydrologic alteration based on priority metrics: That relationship between hydrologic change and biological change is then used to develop indices or scores that can then be used to assess and prioritize how flow is managed in different streams. That is then applied to evaluate management actions and set management targets. He then presented a flowchart showing the process they use, starting with the statewide classification, compiling the bioassessment data, estimating the hydrologic change and comparing the two, selecting the metrics, and then evaluating management actions. Dr. Stein said that California has a robust bioassessment and biomonitoring program, with about 5000 sites that have been evaluated over the last 15 years. 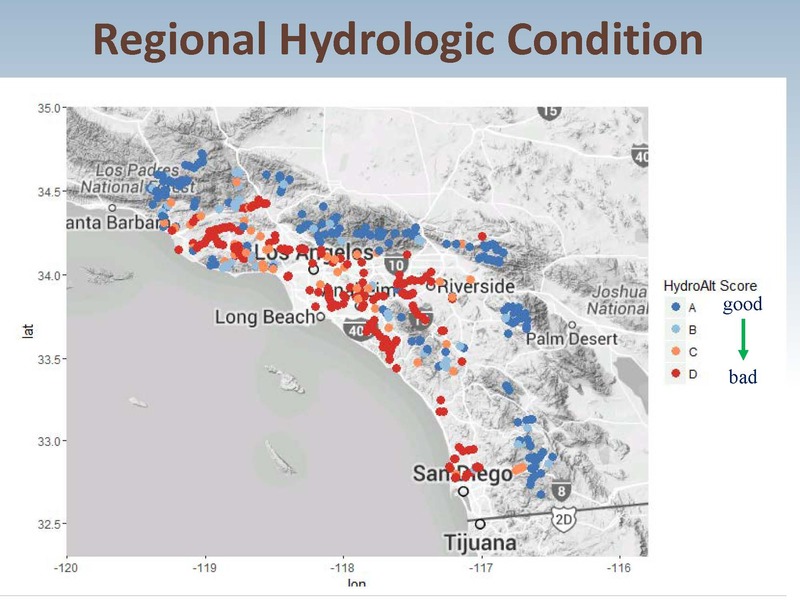 In Southern California alone, there are about 800 sites that have been assessed in the last seven or eight years that they had to work with for understanding the biological condition using benthic macroinvertebrates; the problem is that very few of the sites are gauged, so the first challenge was how to estimate hydrologic change across the broad array of sites, some of which have no gauge data. “So if we have some sites of interest where we have bioassessment data as shown here on the map with the red dots, I can use my model assignment tool, I can pick the right model off the shelf, I basically run it under current land use conditions and so that gives me a daily flow series that is shown in yellow (above, right) which would be the current hydrology,” he continued. “We run a six year simulation which is a synthetic simulation that includes wet, dry, and average conditions so it encapsulates the range of conditions and I get a measure of a current daily flow over sort of a six year period that represents a range of hydrologic conditions. The reason logistic regression analysis was used is because the y axis is reflective as a probability of change. The established threshold in literature for the CSCI is 0.79 which is sort of the breakpoint between reference and non-reference conditions; Dr. Stein pointed out that the number isn’t regulatory but rather it’s based on a comparison to the distribution of reference sites throughout the state. Sites above .79 are considered good sites; below that, not so good sites. 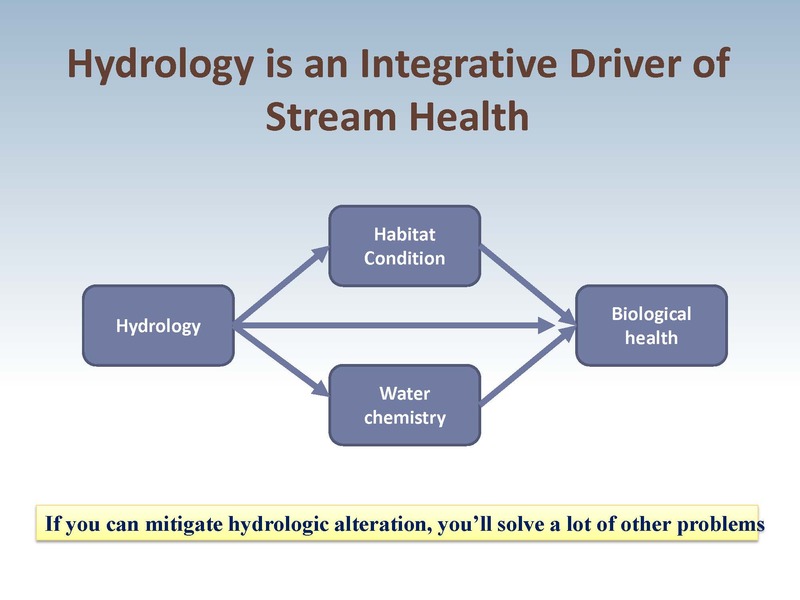 Dr. Stein said that as an output of the workgroup, they have a series of data products that are available, including the GIS for the stream classification, all of those hydrologic models, the ensemble of models and the model selection tool so they can be used for other purposes, as well as all of the biological models. They are all available so they can continue to be built on and used for other regions, he said. In terms of next steps, the workgroup is continuing their work. Similar to the work that has been done for benthic invertebrates, they are starting to use benthic algae as another bioindicator. They are also doing some preliminary work looking at some of the local fish and general riparian habitat using different models, and doing additional causal assessment work to improve the ability to discern flow versus habitat. Question: Can you list a few of the entities who are actually being able to use some of your findings? And then, secondly, you mentioned the effects of water not going into streams from stormwater capture and so forth, but I’m curious … has anybody looked at the implications of adding State Water to the Santa Clara River watershed? For more on the California Stream Condition Index (CSCI), click here. 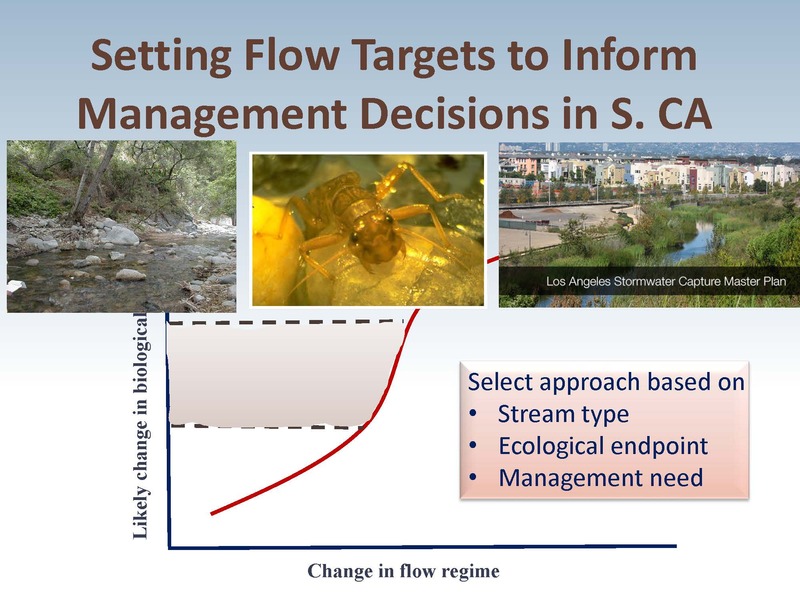 For the data page on flow targets for Southern California streams, click here. For more on the Southern California Coastal Waters Research Project, click here.